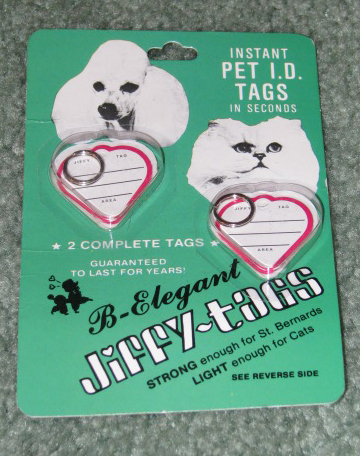 Quick and easy Jiffy-Tags for dogs and cats. These name tags are strong and guaranteed to last for years. Plastic adhesive covers the back and the front for durability. This easy to use dog tag is waterproof and sealed in plastic. Strong enough for St. Bernards and light enough for cats. Package comes with 2 complete tags.